Take mangoes which are slightly ripe and has sweet and sour taste (i.e. it should not be fully ripe but not completely raw too). Peel and cut them into long and thin slices or small pieces. Boil 1/3 cup water in a pan. Add mango slices and cook over low flame for around 4-5 minutes. Add cardamom pods, grated ginger, clove powder, cinnamon powder and sugar. Mix properly and cook over low flame until slices are soft and tender and mixture turns thick or for approx. When mixture turns thick, add vinegar and salt. Turn off flame and allow mixture to cool at room temperature. Sprinkle cumin powder and red chilli powder over it and mix well. The chutney would get thicker as it cools. Use heavy based saucepan or non-stick pan and cook on low flame to allow even cooking and avoid burning. 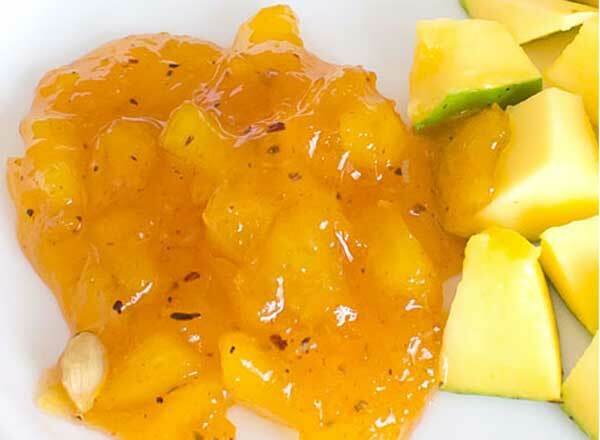 Use raw green mangoes instead of slightly ripe mangoes for tangier chutney. Add more sugar if its too sour. Add more red chilli powder and spices if you love very spicy flavor and taste. In India, sweet mango chutney is known as aam ki chutney and its typically served with Indian breads like roti, thepla, paratha etc. It can also be used as flavor enhancing dip in many spicy snacks, according to Foodviva.